This couldn’t be more true for RBI Austin’s summer leagues. As we’ve grown from 118 kids to more than 1,171 kids, so has our need for gameday volunteers. So whether you are behind the scenes assisting with gameday logistics, helping keep score on the sidelines, or in the thick of the action with the kids in the dugout, our summer volunteers are invaluable. If you’ve been on the fence about serving and wondering just exactly what our various volunteer opportunities look like, check out of summer volunteer roles below. A day in the life: You’re leading the charge for your RBI Austin team. You’re working with your assistant coaches to make sure that practices have a plan, that kids are having fun, and that families are engaged and invited into the team. Typically, head coaches have been involved with RBI Austin before and/or are familiar with RBI Austin’s mission + culture. A day in the life: You’re helping your head coach run the show. This can entail corralling kids, running drills at practice, being in charge of the batting lineup in the dugout. Head coaches cannot coach a team alone, and you play an essential, supportive role in the experience that RBI Austin players and parents have during the summertime. No baseball or softball experience is required, and we will make sure you get trained to do your role well. A day in the life: Do you prefer to be more on the sidelines with a little less commitment than coaching? Scorekeepers help us make sure that games are running smoothly and being documented. You will be posted up behind home plate watching the game, keeping the “book”, and enjoying some summer sun at the ballpark. No experience is required, and we will make sure you get trained to do your role well. Time commitment: We ask that Scorekeeping volunteers serve at least 5 games during the summer! A day in the life: You keep our games moving — literally. Umpires will be trained in specific divisions and will be provided with all of the rules, regulations, and information they need to make sure that RBI Austin games are running smoothly and according to league rules. Time commitment: We ask that Umpires serve at least 5 games during the summer! A day in the life: You’re responsible for bringing the gameday environment! Who doesn’t love the ballpark atmosphere with music and hearing players being announced as they walk up to the plate? Sound/atmosphere volunteers assist with queuing walk-up music and announcing players and teams. Time commitment: We ask that Sound/atmosphere volunteers serve at least 5 games during the summer! A day in the life: A lot goes on behind the scenes to ensure that our RBI Austin kids have playable fields during the summer season. You’re responsible for helping maintain field quality that gives our players a sense of pride in where they get to play. Typically field maintenance tasks include clearing weeds from the infield dirt, building the mound, clearing trash, mowing, and edging. Time commitment: As needed throughout the summer! Saturday, June 9th from 10am-11:30am — sign up here! If you’ve been around RBI Austin for any length of time, you know that we love the games of baseball and softball, but there is so much more to our programs than that, and it starts our volunteers. RBI Austin’s mission is to engage and develop inner-city Austin youth athletically, academically, and spiritually, empowering them to lead the transformation of their communities. We are committed to the development of the whole child. Along with physical development, personal and spiritual growth are critical to the development and transformation of young leaders. If our programs only focused on developing better ball players, we’d be missing the mark. So, how does this play out? How do you help lead and cultivate a culture where our RBI Austin kids develop and ultimately feel empowered to transform their communities? Below are three key elements to RBI Austin’s culture. When a player doesn’t have a ride, find someone on the team to give them a ride or give them a ride yourself. When a player no shows and you can’t get a hold of them, go knock on the family’s door! Yes, go knock on their door. Do everything you can to create an environment where that kid can be a part of your team. That’s how we do it at RBI Austin. We believe pursuing our RBI kids like this not only sets RBI Austin apart from almost any other league around, but it also reflects Jesus Christ’s love and pursuit for each one of us. TWO: Invite parents to have a stake in your team. For RBI Austin to achieve its mission, it is necessary for parents to be highly involved in our teams. In the past seven years, RBI Austin has grown from 1 team to over 80 teams. Parent involvement has been essential to this growth. Invite parents on your team to become coaches, team moms, and scorekeepers. If they don’t know how to do one of these roles, then teach them. Not all parents will accept your offer, but some will! THREE: Balance excellence and fun. We want excellence. We also want fun. We want to compete to win. But we want to recognize we’re here for a much higher purpose. As RBI coaches, we come to practice and games well-prepared to lead our teams with well-thought-out practice plans, lineups, and game strategies. As RBI coaches, we also come to the field seeking to make that time the most fun part of the day for our RBI kids. With excellent coaching and fun coaching, we inspire our RBI kids to live out who God has created them to be, and we keep our kids coming back year after year. We focus on building a culture of community through baseball, softball, mentoring, and the gospel of Jesus Christ. We come alongside kids and families. We are FOR their development, growth, and transformation — both on the ball field and off. Team Sponsorships are available NOW. From having your name printed on the back of an RBI Austin team jersey to receiving a framed team photo, there are some great perks for sponsors. And you’ll have a chance to win Houston Astros tickets, too! Even more exciting, teams that participate will be able to win some great Team Rewards. You can download and print/email the Sponsorship Brochure and the Team Rewards information. Please begin spreading the word to family, friends, coworkers, neighbors, local businesses, etc., and if you have any questions, please email sponsorships@rbiaustin.org. Softball players will get the opportunity to try out for the inaugural RBI Softball Academy Team (16U), that will compete in high-level softball competition during Summer 2018. Players must play on a regular season RBI Softball Summer League team to be eligible for this Academy team. Sign up today to participate in the player evaluation (Sunday, May 20th at 2pm). For questions, email michael.galvan@rbiaustin.org or call 361-207-5921. NOW OPEN: Summer Registration for ALL AGES! RBI Austin Summer Registration is open! 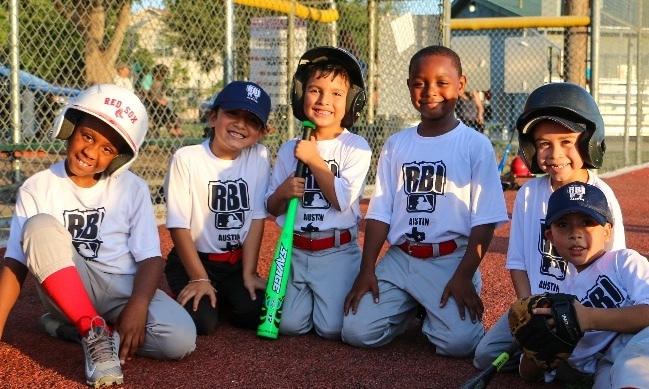 Summer League registration opens today for Jr. RBI Baseball/Softball (ages 4-12) and RBI Softball (ages 13-16)! Register online here for summer baseball and softball! Want to register in person? Attend THIS SUNDAY’S RBI Austin Clinic + Summer Registration Kickoff Day on Sunday, April 8th, 2-4pm at Mabson Field (2812 E. 12th St., Austin, TX 78702). This will be a fun day for players ages 4-14 years to play some baseball/softball, and you can sign them up in person for our summer league. Sign up for this Sunday’s FREE clinic today. Register for the 2018 RBI Austin Summer League! Sign up for the FREE clinic on 4/8!